Uvonair 1000 Room Ozone System. The Uvonair 1000 room ozone system is a air purifier which neutralises odours and inhibits moulds and bacteria in the air by meas of Ozone. Ozone neutralises odours and inhibits moulds and bacteria in the air. The Uvonair 1000 produces enough ozone to help keep the air fresh and clean in areas up to 1000 cubic feet (30 cubic metres / m3). Great for keeping rooms free of infections, moulds and eradicating smells. The Uvonair 1000 In-Room Ozone Generator is a professional quality ozone generator that uses a 150mm (6 inch) ultraviolet lamp to produce 7,2mg of ozone per hour. 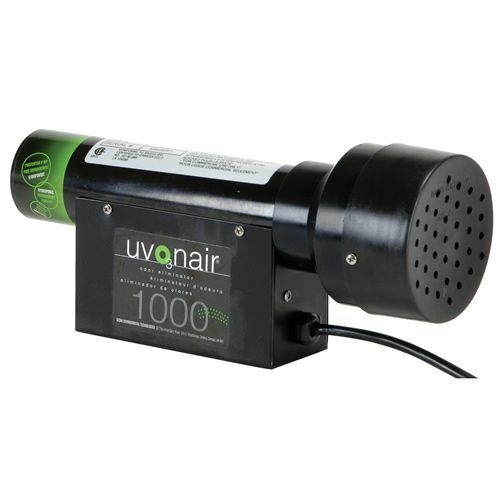 The Uvonair 1000 then uses a fan to release and spread the ozone into a room. When ozone is released into a room, it neutralises odours, bacteria and mould spores that it comes into contact with, making the air considerably cleaner and fresher-smelling. The Uvonair 1000 is highly effective in a room up to 1000 cubic feet (30 cubic metres / m3) in size. The Uvonair 1000 incorporates a convenient power switch so that the unit can be easily switched on and off. Please note that too much ozone can be harmful. With a test strip there can be measured if not too much ozone is created.